Q: Kimi, was it better for you that the radio had some problems and you couldn’t understand the guy from the pit wall? Kimi RÄIKKÖNEN: No actually – I could hear them but they couldn’t hear me. I think it only worked in one part of the circuit and unfortunately today there was quite a lot to discuss and it didn’t work. So, not the ideal but we managed to do pretty well and obviously we want to win but today we didn’t have the speed. The race should have been a bit longer, maybe then we could have had a good chance – but we scored good points for two cars and we are getting back where we should be. So in the end not ideal but pretty OK for us. KR: Obviously not, because we didn’t win it. I was stuck behind the Mercedes after the first stop for a little while until I got past them. It cost me some time. After the Safety Car we were pretty OK and the cars, three of us, had similar speed and it’s very difficult to overtake anybody. I could run longer and we had a think about it, if we can try to run until the end but we had a massive problem with the radio. I could hear them but they could only hear me between two corners. So I’m wondering if we should have done it, take a gamble and try to go to the end because the tyres were pretty OK, my speed was pretty OK so it was hard to know what happens in the next ten laps. We decided to come in and put the soft tyres. We had good speed. Obviously I got some help from Romain to get past but that was… we would have had a big fight, anyhow. I could have probably passed him in a normal situation but obviously it would have cost me a lot of time. And as a team we try to win and I caught up with Seb but, like I said before, everybody was behind each other but we are too close on speeds and it’s so difficult to overtake then. We tried everything that we had and failed to win but I think for the team we did a good race and got both cars on the podium, so as a team we’re happy but obviously I lost some more points to Seb in the championship. We keep trying. Q: (Kate Walker – GP Week) Sebastian, Kimi is one of the men on the short list to replace Webber as your teammate next season. In the closing stages of the race, we saw him giving you quite a bit of challenge. How do you feel about the prospect of being challenged by a fellow World Champion in equal equipment for an entire season rather than just a few laps? SV: Well, I wouldn’t mind. I think he wasn’t nice today to me because of that but in the end of the day, to be completely straight, it’s not my decision. I think I have a good relationship with the team and to be honest, we spoke about that but not in detail yet. I think the team has no pressure to decide on anything, at least, that’s what they communicated with me. I think I get along fairly well with Kimi; we never had a problem on track, even if one day we might have and crash into each other which can happen, then I think we deal with it as grown-ups and talk about it and sort it out amongst ourselves, at least, I think that’s the relationship I have with him. I respect him a lot on and off track. But like I said, it’s not my decision. Q: (Kate Walker – GP Week) Would you be excited by the challenge? SV: Yeah, definitely. I think it’s strange in a way because I was looking up to Kimi when he was with McLaren for many years and trying to give Michael a very hard time but his McLaren broke down many times and now, since he’s come back, I’ve raced him again and I think there’s no doubt that when it comes to qualifying, to race, he does his job very well and gets the maximum out of the car, and that’s what – at the end of the day – is our job. He’s quite good at what he does. That’s my opinion. KR: He seems to be a bit better. I don’t know what will happen in the future. Things will be decided at some point but until that happens there’s nothing to talk about. I would definitely tell if I know something just so that all these follow-up rumours and nonsense stops straight away. But right now, there’s absolutely nothing for next year and we will see. For sure, at some point, once we know we will tell but I don’t have any pressure to make any decision right now. Obviously I try to make the right decision for myself but it depends on many things; next year there are rule changes, everything else, so it can be a right or wrong decision. Whatever it will be, I will live with it and I’m fine with it. We will see when it comes. Q: (Heikki Kulta – Turun Sanomat) Kimi, your best ever result in Germany. Does it taste any better than the previous ones or is it only victory that makes the difference? KR: Obviously we are here to try and win races. We couldn’t today because we were not fast enough but for the team it was a good result after a couple of quite difficult races, so obviously for my championship it was not ideal, we lost some more points but it’s still a long season and if we keep putting ourselves in a position for at least fighting for first place then I think we can do it again but as I said, it’s good for the team and not so good for my championship. Q: (Livio Oricchio – O Estado de Sao Paulo) And to Romain and Kimi, is the performance of your car also related to the new tyres? KR: First of all, I don’t think it’s a 2012 tyre. The front tyre is exactly the same as all year. The rear belt is different but it’s not the construction of 2012. We tried these tyres in Montreal and they were fine. It’s not a very big difference to what we ran before so for us, I don’t think it made any difference. They felt a little bit better tyre in Montreal. I think the biggest difference is on high downforce circuits but the weather is hot so that’s probably what made the bigger difference for us. Q: (Andrea Cremonesi – La Gazzetta dello Sport) Kimi, during the last laps, did you think about the opportunity of being with Red Bull and if that had an effect on your mood during the fight? KR: Absolutely not. I try to win and it doesn’t matter if it’s a teammate or some other team. As long as we give ourselves a chance, I try to make it happen and obviously if there is a good chance to try to overtake I will try it but we never got that close so there was nothing to do really. Totally agree with u, what a silly question. Ridiculous. Watching the debrief on french TV, according to a journalist( Jean Louis Moncet, very credible guy), Kimi has signed a contract with R.Bull which stipulates that if Kimi leave Lotus, then he’ll be at R.Bull nxt year. Dnt knw if its true but he’s quite a credible person, he’s one of the most respected french journalist in F1. He said that according to his sources Kimi…. 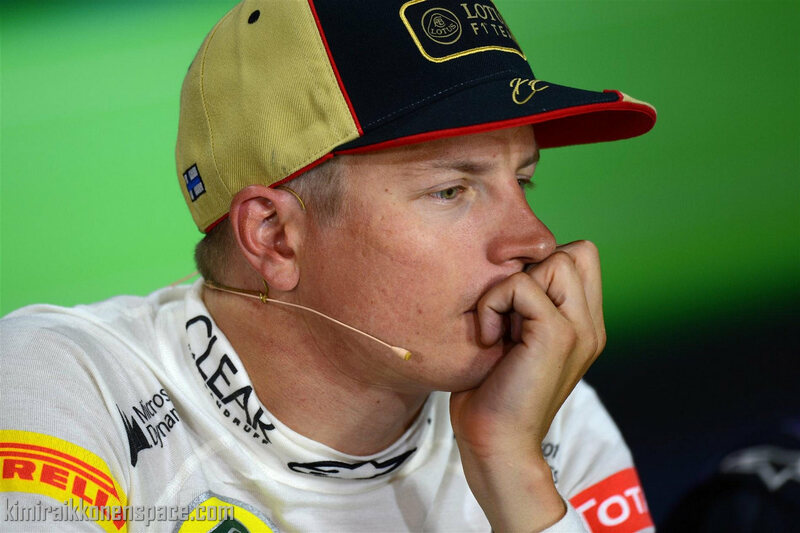 The contract doesn’t mean Kimi is a R.Bull driver nxt year, its only IF he leaves Lotus… So Kimi has only 2 options. P.S: J.Villeneuve during the race yesterday: “Kimi is the driver doing the most number of zig zag while protecting his position this season.” Hats off man. How nobody had already beaten stupid Villeneuve?! Kimi doing zig-zag? Come one! Is Kimi the only person he sees? Did he take a look at Alonso’s zig-zagging at the starts or Mercedes? How they even let hem be so biased and jealous?! Ok, Jacque, find the seat and prove that you are faster! Prove your words on track!